The cult US TV show Game of Thrones is a hit for many reasons. Its combination of fiery drama, fast-moving plot twists and quick-witted one-liners keeps viewers on tenterhooks. A cast of extremely talented actors portray complex, multi-dimensional and believable characters. It is also filmed in a series of stunning worldwide destinations, ranging all the way from Canada to Morocco. Indeed, some of most beautiful scenes have been in sunny Croatia, not far from our fractional boat locations. 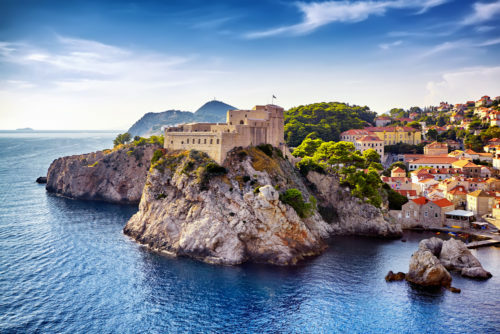 With everyone eagerly awaiting its eighth and final series – due to be released in 2019 – we have rounded up five of our favourite Croatian Game of Thrones filming locations. Next time you are sailing through, stop by and visit… you won’t regret it. GoT identity: The infamous Blackwater Bay. Iconic Scene: In season 3, Shae and Sansa Stark sit by the docks and watch the ships before Littlefinger arrives to discuss escape plans with Sansa. Why Visit: This beautiful spot in Dubrovnik old town used to be an important passageway for mariners arriving in the western part of the city. Offering breath-taking views of both Bokar and Lovrijenac Fort, the cove is still very popular with sailors today. Iconic Scene: The fort features heavily throughout seasons two and three, but it is most memorable as where Varys compliments Tyrion, telling him that he’s ‘quite good’ at being the hand of the king. Together, they make plans of how they will vanquish Stannis Baratheon’s army. Why visit: The stunning 15th century Bokar Fortress (or Zvjezdan) is located on the South-western part of Dubrovnik City walls. Open to the public all year round, it is a true testament to strong medieval fort architecture, not to mention beautiful to look at as you sail past on your fractional yacht. GoT identity: King’s Landing – the palace garden. Iconic Scene: In season three, it is here that Sansa is pressured to spill information about King Joffrey to Lady Olenna, otherwise known as the Queen of Thorns. Lord Varys and Olenna also come together in the palace garden to discuss Sansa’s wellbeing, walking through the lush greenery. Why visit: This beautiful 15th century garden is easy to get to by yacht, found just 20 minutes outside Dubrovnik, and offers incredible views across the Adriatic Sea. Iconic Scene: In season 7, Daenerys stands in Dragonstone’s imposing throne room, declining to sit and instead proceeding to the Chamber of the Painted Table, where she famously asks: “Shall we begin?” This is also where Daenerys’ dragon training takes place, and where in season 4, dozens of slaves deliberate over whether or not to fight for her. Why visit: Split, Croatia’s second-largest city, is a favourite destination for fractional boat owners. The 1700-year-old Diocletian’s Palace remains its most famous site. Despite dating all the way back the 3rd century, the palace’s underground tunnels are still perfectly intact. Wander around its spooky passageways and cellars and reflect on the history between these walls. Famous Scene: In season four, this fortress is the exterior filming location for the defeat of Meereen, the largest and most populous of the slaver-cities. Near to the top is where Daenerys crucifies the city’s former rulers, displaying their dead bodies for everyone to see. 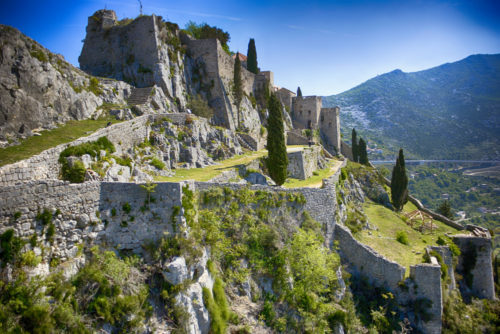 Why visit: With panoramic views across a valley and the city beneath, this impressive fort has guarded the Croatian frontier for over 2,000 years. Hike to the top and feel like you’re king of the world. Contact SmartYacht to learn more about the boats we have available for exploring Croatia and beyond.